Emirates, the world’s largest international airline, and Formula 1®, the pinnacle of motorsport, today announced they have renewed and expanded their partnership until the end of 2022. 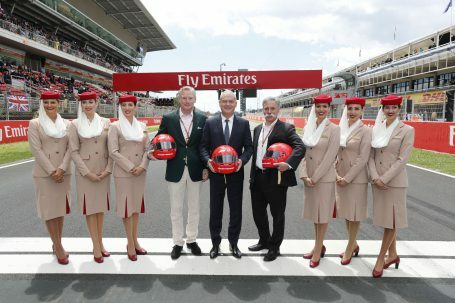 Emirates has been an F1 Global Partner since 2013, and the renewed agreement will see the airline enjoy an expanded branding and consumer activation presence at over 15 races on the FIA Formula One World Championship™ calendar across Europe, Asia, Australia, North America and South America. The renewed agreement, which came into effect at the start of the current 2018 season in March with the Australian Grand Prix in Melbourne, also includes Emirates being the Title Sponsor of today’s Spanish Grand Prix in Barcelona, and for the German Grand Prix in Hockenheim from 20-22 July. “There’s an excellent fit between Emirates and Formula 1, from the global extent of our destination network and the cities in which races take place, to the focus on innovation and technology that underpins the sport and our approach to the development of products and services for our customers. Formula 1’s global appeal also provides us with an opportunity to share in the passion of the millions of fans who follow the sport, many of whom are our customers,” said Thierry Antinori, Emirates Executive Vice President and Chief Commercial Officer. As a Global Partner of Formula 1® for the next five years, Emirates will have extensive trackside branding at the races, hospitality for guests at the Paddock Club, interactive fan engagement activities at F1 Fan Zones and F1 Fan Festivals at selected races, as well as Supercar Hot Laps at eight races and branding across digital media assets. Emirates will also offer its Skywards members the opportunity to use their miles to bid for exclusive VIP experiences at the various races. Emirates currently flies to more than 155 destinations across six continents from its Dubai hub, and is able to connect fans to most of the countries hosting races, including Austria, UK, Germany, Italy, Belgium, Hungary, Singapore, Japan, Australia, Russia, Brazil and the US. The full race calendar can be found here.